The crows were at their usual perch when the walking duo came around today. The sight of the walkers elicited a vociferous call from one amongst them and this triggered Josh’s recollection of the story he had been told yesterday. “In 2009, these UK researchers tested four captive rooks with a clear narrow-neck tube containing some water,” answered Rosh, “Safely floating on it out of the rooks’ reach was a juicy worm." "They piled some stones near the tube to see if the birds would put multiple stones in and get the worm by making it float up to the top. All birds did what needed to be done without hesitation." “But the rooks could have thrown the stones in to play, not knowing what else to do with them?” doubted Josh. “Dr Emery told BBC News of another experiment in which the rooks were now given a combination of small and large stones. Interestingly, the rooks opted more for the larger ones, raising the worm to the top more quickly. So, the birds were efficient too." “I’m sure you’d probably do that too, given half a chance,” Rosh answered smilingly, “But will that prove you are not intelligent?" "Anyway, given a choice between a tube filled with water and another filled with sawdust, the rooks did show a preference to fill the water-filled tube." “It’s easy to think someone is weird if they don’t look like us. And birds aren’t even humans, so it is easy to discount their intelligence. 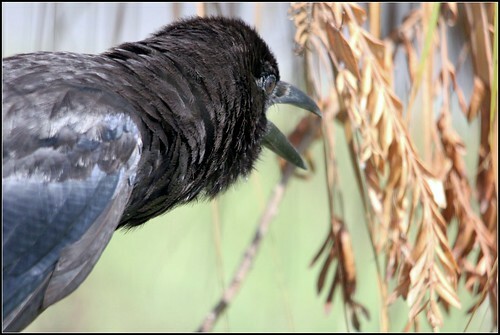 A research done with crows of the Pacific island of New Caledonia was reported in the journal Science earlier in 2007." "In that, Christian Rutz, lead author of the paper from the Department of Zoology at the University of Oxford, UK noted that they had filmed these crows using grass stems." "This was interesting because these stems have quite different physical properties from the sticks and leaves that we knew crows use." "They were surprised because these crows were using these grass stems on the forest floor, probing the leaf litter, possibly fishing for ants." "These findings have advanced our knowledge of bird intelligence, even though their tool use is by now well-documented." "Another 2009 study published by a University of Oxford team found that New Caledonian crows were able to use multiple tools successively to get to food. They also used tools in the wild, crafting them from branches to pluck grubs from holes and crevices." "In this study, captive crows were presented with several horizontal tubes. One of the tubes contained unreachable food. The others had long and medium-length hooks – all also out of their beak's reach. Only a short hook-like tool was within reach." "The crows picked this short tool, then used it to grasp the medium-length one, which was then used to pull out the longer tool which could reach the unreachable food. Using this, the crows pulled out their food without any trouble." "Interestingly again, this wasn’t a one-off bird showing greater intelligence. More than half the birds tested were able to use these three tools in the right order to get to their food. Professor Alex Kacelnik said that the complexity of the task made it unlikely that the crows were solving the problem using trial and error." “Tell me more about the crows Pa,” urged Josh as he looked up at the crows again, "They are interesting."